The Sunshine State has gone further solar with a new 1 MW PV system on the roof of the Orlando County Convention Center, that is now the largest rooftop solar installation in the southeastern U.S.
Credit a convention center at the other end of the country-in San Francisco-for inspiring a new photovoltaic system atop the Orange County Convention Center in Orlando, Florida. 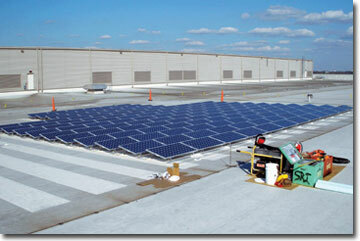 "The manager responsible for the development of the Orange County power system was in San Francisco for a convention years ago and saw they had a solar array on one of the roofs of the convention center," explains Steve Van Skiver, Johnson Controls' Southeast solutions installation manager, based in Tampa, Florida. "He thought: I live in the Sunshine State. 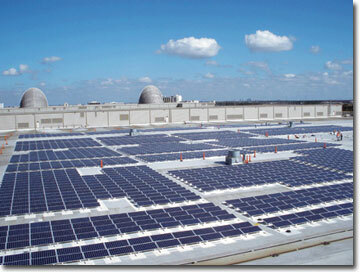 We should have a PV power system on our convention center roof." Van Skiver is referring to Jerry Daigle, convention center deputy general manager. San Francisco's Moscone Centre has a 675kW PV system that was installed in 2004. But it wasn't until two years ago that Orange County Convention Center administrators began working in earnest to develop and install their own rooftop PV system. 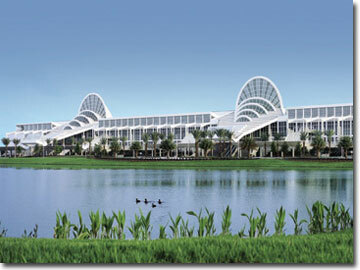 With seven million square feet of exhibit and meeting space, the Orlando facility is the second largest convention center in the United States, with only Chicago's McCormick Place being larger. The 1-megawatt roof-mount, single crystalline PV system-the largest rooftop solar installation in the southeastern U.S.-was dedicated, appropriately, at the Green Cities Florida convention this past May. By comparison, Atlantic City boasts the nation's largest convention center PV system with more than 13,000 solar panels and a rating of 2.4 MW. In addition to Orange County's main system, four 10-kilowatt systems were installed that feature different PV and racking systems for testing and evaluation. The PV system netted the Orange County Convention Center a designation of Solar America Showcase from the U.S. Department of Energy. The recognition is given to projects that are large scale, highly visible, and involve novel or cutting-edge types of solar energy technology. Solar generation is also in keeping with the green goals of the convention center, says Gwen Wilson, convention center public relations manager. In 2007, the center was the first facility of its type in the U.S. to be ISO 14001 certified for recycling, she says. About 40 percent of the waste stream is reused or recycled. In addition, the convention center has installed LED lighting and motion detectors to turn off lights when rooms are not occupied, installed xeriscape landscaping (which achieves water conservation through creative landscaping), and uses low-flow water faucets and waterless urinals. "We are always looking for better ways to save energy as we are a seven-day-a-week operation," Wilson says. "We have to look at ways we can be more efficient." Work on the solar array began after the convention center received a $2.5 million Florida Renewable Energy Technologies Grant. With the funding, came a requirement for an educational component, Wilson says. The Orlando Utilities Commission (OUC) also contributed $1.5 million toward the $8.8 million project as a "sponsoring utility partner," says Erika Hodges, a commission spokeswoman. The utility's participation was part of an effort to expand its renewable energy portfolio. The money came from the utility's capital expense budget and was not from surcharges levied on customers to pay for renewable energy projects, she says. "The convention center installation offered a large project that could be built fairly quickly and provide a substantial solar contribution to OUC's current generating mix," Hodges said. In return, the utility will receive 10 years worth of renewable energy credits equivalent to that amount. In spring 2008, the convention center released a request for proposals and eventually awarded the design-and-build contract to Johnson Controls, which is based in Milwaukee, Wisconsin. The system features nearly 6,000 175-watt Sunmodules from SolarWorld of Hillsboro, Oregon. Johnson Controls chose Sunmodules because they are one of the higher efficiency and higher quality solar modules in the industry, says Don Albinger, vice president of energy solutions in Milwaukee. "We don't put just any panels on the job," Albinger says. "These systems last 20 to 40 years, so you have to be really concerned about the overall quality and manufacturing and the type of support you get from certain solar suppliers." Construction on the project began in December 2008, which worked well with the weather. "We were completely out of the hurricane season, so that wasn't a factor," Johnson Controls' Steve Van Skiver says. The 200,000-square-foot system, which features flat-plate collectors, was installed on the roof of the convention center's north-south building. VB Engineering of Boca Raton, Florida, consulted on the electrical side of the project. One of the few challenges was obtaining 5,800 panels in a short period of time, Van Skiver says. Then the panels had to be delivered and hoisted onto the roof. The convention center is a sprawling facility with about 1.5 million square feet of rooftop. Installing the racking system was much like putting together a puzzle consisting of 6,000 pieces, each 2 feet by 4 feet, he says. They also had to design a system with a minimum number of penetrations into the FiberTite membrane roof. At the same time, the mounting system had to be able to endure hurricane winds of 110 to 115 mph. The result was a combination of mounting systems that also involved ballasting. "We had to get it all lined up and not hit anything," Van Skiver says. "We had to coordinate the array and the existing roof, which had lightening rods, roof drains, and all sorts of things you could bump into." The actual installation was done by Solar Source of Largo, Florida. The convention center couldn't shut down during installation, which posed a different type of challenge for Johnson Controls, Wilson says. "They had to work around all of the events that were held," she says. "Most people aren't used to that many people coming and going every single day." The convention center hosts more than 250 events and 1.4 million attendees annually. The system features four 250-kW Satcon PowerGate Plus inverters as well as four smaller 10kW inverters on the experimental systems. Although the system is grid connected, most-if not all-of the energy generated will be consumed by the convention center, Van Skiver says. Solar is well suited to areas with a sunny, warm climate, such as Florida, because peak power is generated in the afternoon, Albinger says. That's roughly the same time of day that utilities experience peak demand, as rising temperatures prompt increased electricity demand from air conditioners. But the heat can also be a downfall, he says. "Solar technology, like any other electronics, has a particular output curve that is dependent on heat, so the hotter it gets, the less output you have," Albinger says. "The colder the climate where solar power is, the more production it will give us." The difference is typically only 10 to 15 percent. The convention center is but one of numerous projects (in the works or recently completed) in the Sunshine State that feature PV or solar-concentrating mirrors. The completed projects have propelled Florida into the No. 2 ranking among U.S. states, behind California. The convention center's PV system should last about 40 years, with a payback in less than half that time. The Orange County system is expected to generate 1,300 to 1,500 MW hours of electricity annually, which is equivalent to what 80 to 100 typical residential homes use annually. The system will provide about 10 percent of the convention center's peak use in the north-south building. The PV solar system at the Orange County Convention Center features nearly 6,000 of SolarWorld's 175-watt Sunmodules (above). Johnson Controls, which had the design/build contract, chose Sunmodules because of their high efficiency and high quality. As part of the project, Orange County developed a 3,000 square foot Climate-Change Education Center in the convention hall that will showcase solar energy as well as other ways people can reduce global warming. A monitor will show visitors how much energy the PV system is currently generating. Visitors to the convention center's website, www.occc.net/Community/live_feed.asp, can view how the experimental systems-as well as the main PV system-are performing in real time, courtesy of Fat Spaniel Technologies. "Education is very important to us, not only internally within our organization, but also to our customers," Albinger says. "We want to make sure that the attributes of solar power and renewable energy power are understood. It's economically viable, so education is really key."